Executive Director of the People’s Action for Free and Fair Elections (PAFFREL) Rohana Hettiarachchi says that a large number of various ‘criminals and rapists’ have received nominations to contest the upcoming Local Government election. He made these observations during the election watchdog’s first press briefing with regard to the Local Government Elections 2018, held in Colombo today (11). PAFFREL said it has received 243 complaints, out of which 182 were confirmed, in the 30 days gone since nominations were called for 341 LG bodies. Out of the complaints received most were politically motivated food entertainment and secondly illegal election campaign activities, it said, adding that 70 food entertainment complaints have been reported. In addition, complaints relating to distribution of sewing machines, school text books, home appliances, agriculture equipment, cement, roof materials, job oriented forums and financial aids were also received. Complaints relating to road development activities were received in many areas. According to stats provided by PAFFREL, 61 complaints regarding the UNP, 60 regarding the SLFP/UPFA and 48 regarding the SLPP have been received so far. Up to now, it is reported that 10 complaints have been received against woman candidates, out of which 6 women candidates were affected. 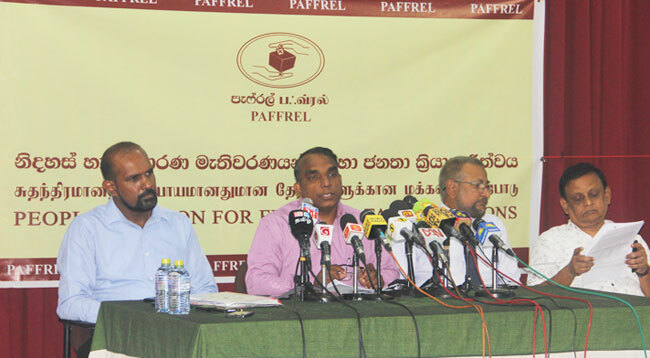 PAFFREL said one incident is with regard to an attempt to molest a woman candidate of SLFP in Anuradhapura district.